Activists rally in Burnaby, British Columbia, against the Trans Mountain Pipeline expansion March 10, 2018. 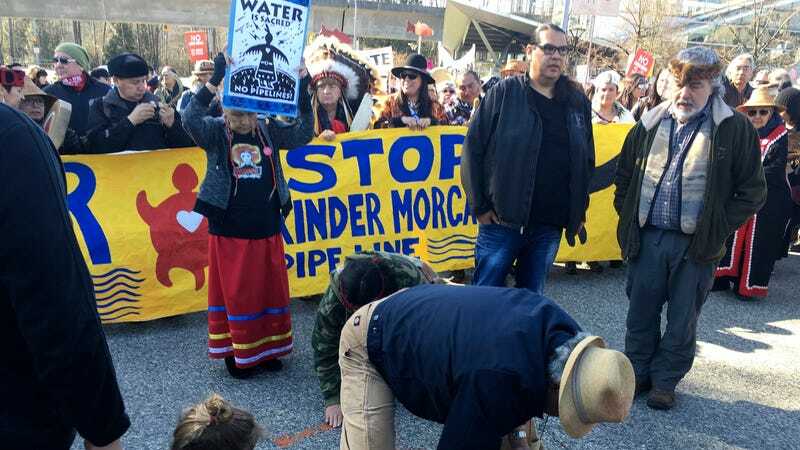 In the city of Burnaby, British Columbia, indigenous-led pipeline opponents are revving up their efforts to stop a 715-mile pipeline expansion that’ll essentially create an entirely new oil pipeline across Western Canada. They’ve been out in the streets since March 10, and law enforcement has arrested 172 people since then. It’s getting real. The relentless attempts to keep construction of the Trans Mountain pipeline expansion at bay—including people locking themselves to excavators, chaining themselves to vehicles, and even climbing trees at a Trans Mountain site—feel eerily reminiscent of what the world saw at Standing Rock two years ago. So does the Burnaby Royal Canadian Police’s response of handcuffing and arresting these environmental defenders. The existing pipeline, owned by North American energy company Kinder Morgan, already runs 715 miles. This expansion would add a similar crude oil line to run the same course between the Alberta oil sands and a British Columbia oil terminal, nearly tripling the system’s capacity from 300,000 barrels to 890,000 a day. Well, that’s if it can overcome the opposition. First Nations—including the Tsleil-Waututh, Squamish, and Musqueam—are determined even if the fight isn’t leaning in their favor. Prime Minister Justin Trudeau supports the project even though he’s supposed to be all about helping Canada’s indigenous tribes. The B.C. government, which opposes the pipeline, attempted to overturn a decision from the National Energy Board that allowed Kinder Morgan to ignore city bylaws, but a federal appeals court refused to hear the case Monday. The company also met its March 26 deadline to have trees cleared before migratory birds come to nest. A court-ordered injunction prohibiting protesters from obstructing construction is behind most of the mass arrests, but this kind of policing comes with a price—one that Burnaby Mayor Derek Corrigan is not about because his city wasn’t the one that approved the expansion. Ottawa did. “The federal government should be standing up now and saying, ‘Yeah, we’ve exercised our jurisdiction, we told the city and the province that they have no right to come in and deal with Kinder Morgan line on their property, and as a result, we’re the ones who are going to be responsible for ensuring that policing is done,’” Corrigan told Global News Radio. The price of the current policing situation remains unknown, but 2014 protests racked a bill of $800,000, which the city still refuses to pay. North Dakota knows these costs all too well. Policing the camps born out of Standing Rock’s fight against the Dakota Access Pipeline amounted to more than $37.8 million. And the North Dakota Attorney General’s Office wants the federal government to help cover those costs. But, like, who told the state go ahead and arrest more than 800 people? North Dakota had no court-ordered injunction forcing it to do this. It did so voluntarily. In B.C., at least pipeline opponents have won the support of some politicians: Green Party Leader Elizabeth May and New Democrat Party Parliament Member Kennedy Stewart were among the arrested this past week. With First Nations, the cities of Vancouver, Burnaby, and the Province of British Columbia against this energy infrastructure, maybe Trans Mountain opponents will have a better chance than Standing Rock ever had. They’ve got until September 2020, when the pipeline is set to be completed.